Ruqaiya Khan: Dial's Festive Foaming Hand Washes for the Holidays! 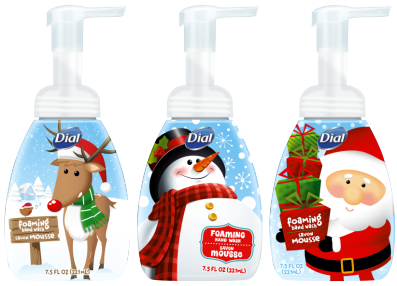 Dial's Festive Foaming Hand Washes for the Holidays! Festive Foaming Hand Washes to Deck your Counter-Tops with Holiday Cheer! This holiday season, Dial® is keeping your family’s hands feeling moisturized, healthy and refreshed with their NEW Holiday foaming hand wash! Packed with all you need to clean up after baking cookies or wrapping presents, your hands will be winter-ready and smelling fresh! Featuring three jolly limited edition seasonally-inspired designs (shown here), your countertops will be as decorated as the tree! Plus, kids won’t be able to wait to wash their hands, which is an added perk during the cold and flu season. NEW Dial® Holiday foaming hand wash is even thorough enough to hide St. Nick’s fingerprints! NEW Dial® Holiday foaming hand wash will be available beginning December 1st, 2013 for a limited time at leading retailers including Walmart, Loblaw’s, and Safeway. Suggested retail price of $2.99 to $3.49 (221 mL) for each individual hand wash. Hurry and get yours now, because just like St. Nick they’ll be gone after the holidays!